Marx’s statement that “history repeats itself, first as tragedy, then as farce,” must now be reworded, in light of the new Cold War developing with Russia and that country’s alleged interference in the 2016 U.S. presidential elections: “history repeats itself, first as tragedy, then as farcical, potentially catastrophic, tragedy.” We are witnessing the unfolding of a drama with an undeniably Rabelaisian protagonist – President Donald Trump – a character so monstrously flawed as to be scarcely imaginable as anything other than a real-life, modern-day scion of the fictional Pantagruel, the grotesquely cruel King of the Dipsodes. Surrounding Trump are many courtiers of varying degrees of fatuity and mendacity. And since Trump’s decision to batter an airfield in Syria, a Russian ally, with Tomahawk missiles, an array of print-media pundits and cable-channel panjandrums slaving away after mammon and ratings has cheered him on. Finally, they say, he’s showing he’s not “Putin’s puppet” and is acting presidential! Though Trump himself has recently tweeted, “Things will work out fine between the U.S.A. and Russia. At the right time everyone will come to their senses & there will be lasting peace!” the whole Trump-Russia-collusion affair is dangerous, melding, as it does, high-stakes U.S. domestic politics with our increasingly tense relationship with an adversarial Russia. At stake, of course, is no fictional kingdom. Given the nuclear arsenals of Russia and the United States and the “completely ruined relations” between the two powers, the fate of our planet may well hang in the balance. We need to examine the Trump-Russia scandal with sangfroid and figure out where it is leading us internationally. Nowhere good, it turns out. But I’m getting ahead of myself. The report merits a quick review now. What strikes careful readers of the document is not flagrant evidence of Trump’s treason, but the guarded language the authors deploy in presenting “assessments” (essentially, speculation, with varying degrees of confidence) about the Russian government’s motives, intentions, preferences for candidates, and cyber tactics. In sum, the report does not so much as state facts but make a case. The report’s main conclusion: as the 2016 campaign progressed, the Kremlin developed a preference for Trump over Hillary Clinton and decided to help put him in the White House. Through its GRU intelligence service, the Kremlin (on orders from President Vladimir Putin personally) arranged for the purloining of emails from the Democratic National Committee and passed them on to Wikileaks and other collaborating sites, and, additionally, used trolls and state-controlled media (mostly the satellite channel RT, formerly Russia Today), to “undermine public faith in the US democratic process, denigrate Secretary Clinton,” and swing the odds against her. Critically, the report does not “assess” that Russia hacked American voting machines. The Kremlin, says the document, will likely continue its efforts to undermine the American democratic enterprise. Let’s pause to consider this statement, so indicative of the aforementioned American blindness and hypocrisy. RT is licensed (through TV Novosti, a subsidiary) to broadcast in the United States and has a legal right to offer American viewers whatever it sees fit. It may surprise someone somewhere on the planet that the Kremlin heavily influences what the network airs; informed viewers might have already suspected as much, given that RT is, well, Russian state media, and not, say, the Voice of America or Radio Liberty, which the U.S. Congress funds, or CNN or MSNBC, both beholden to corporate masters. Does presenting a point of view to Americans, even one held by the government of another country, constitute “interference” in “US domestic affairs”? If it does, one would assume, Russia has every right to jam the Voice of America and Radio Liberty. The Soviet Union did this; Russia does not. And just how much could RT have “interfered in US domestic affairs” with its nefarious shows? That depends on how many watch them. It’s tough to say how big RT’s American audience is. The annex tells us that, “RT states on its website that it can reach more than 550 million people worldwide and 85 million people in the United States; however, it does not publicize its actual US audience numbers (RT, 10 December).” But the real figure may only be a fraction of that – a number so small that the Nielsen Company does not bother to rate the channel. RT’s “social media footprint” is impressive on Youtube, but not so at all – critically – on Twitter or Facebook, where in “likes” and followers, CNN and the BBC crush it. In sum, RT’s “interference” in the American democratic process could not have amounted to much. The same cannot be said about the hacked DNC emails, which the report accuses Russia of providing to Wikileaks and other sites last summer for subsequent, well-timed release to the public. The emails showed that the DNC skewed the primaries against Senator Bernie Sanders, Clinton’s contender for the nomination; news of this led to the resignation, in disgrace, of DNC chairperson Debbie Wasserman Schultz. No one contests the veracity of these emails. That the DNC so mistreated Sanders in favor of Clinton should outrage American voters and be the key issue for Democrats today. After all, Sanders, polling data showed, would have defeated Trump in November by as many as fifteen points. That it has not been the issue has everything to do with the Clinton campaign’s decision to dispense with the inconvenient affair by declaring, in effect, that a vote for Trump was a vote for Putin; and Clinton’s insistence, even now, that Russia helped win the election for Trump. Moving away from the intelligence agencies’ report, we need to ask questions rarely raised in all the Trump-Clinton-Russia hubbub. The Russian media did openly broadcast in favor of Trump; and Russians did, by and large, hope he would win. Why? There are objective reasons. For starters, the Obama administration had openly opposed Putin’s reelection to the presidency in 2012, with Vice President Joseph Biden showing up in Moscow the previous year to announce that the White House did not want Putin to run; Obama had dissed Putin publicly and spoken disparagingly of Russia, and, lest we forget, overseen the imposition of a burdensome sanctions regime on Russia following the outbreak of the Ukraine crisis. The sanctions in particular have made life harder for Russians, and they blame Obama for them. Clinton, held to be Obama’s chosen heir, had compared Putin to Hitler and promised more of the same hard line. Trump, in contrast, famously declared his desire to repair relations with Russia and cooperate with it in Syria in the fight against ISIS; and, of course, he had voiced his admiration for the Russian leader many times. Despite all this, solid grounds exist for assuming that the Kremlin would not have wanted to mount a clandestine operation to help Trump win. In retrospect, they seems obvious, but in prospect, not so much. The Kremlin had to believe that American pollsters and media would be correct in predicting a Clinton victory. A cyber campaign against her, the certain victor, carried the risk of discovery. Would Putin – who is nothing if not calculating – really have wanted to risk making a future President Clinton even more hostile toward him than she seemed to be in her public pronouncements? Privately, Putin, Wikileaks revealed, had an amicable working relationship with Clinton when she was secretary of state. He surely knew her to be reasonable and forthright, someone he could do business with. Trump, in contrast, appeared impetuous, unpredictable, and irrational, with a penchant for lying and no demonstrable political skills – something he could not do without if he had to, say, persuade a hostile Congress to go along with a future deal with Russia. A candidate who evinced almost daily his sui generis lack of qualification for the White House might reasonably have appeared dangerous to the Russian leadership (just as he did to most of the rest of us). As for Trump, if he really were colluding with Russia, would he have so recklessly asked Russia to find Clinton’s thirty thousand missing emails? Would he have so often expressed a desire to “get along with Russia” if he thought he might be unmasked as conspiring with the Kremlin to steal the elections? One has to assume he would do just the opposite. All the ifs and assumptions and anonymous sources and innuendo are wearying. We need a nonpartisan investigation to settle the whole affair. That Republicans and the White House are doing their best to prevent this is worrisome, but not proof of guilt. We just do not know the truth. The question of Russia’s possible role in Clinton’s loss aside, from the tornado of Russia-related accusations swirling around Trump and his team, one might be tempted to conclude that meddling with elections was a peculiarly Russian sin committed against a uniquely chaste United States, the institutions and practices of which stand as paragons of probity unparalleled in the annals of human history. One would, of course, be wrong. A peculiarly American sin in this mess is one of omission. Those bewailing Russia’s evil ways do not mention the longstanding U.S. penchant – covertly indulged but thoroughly documented – of influencing the outcome of elections abroad and even overthrowing governments. Russians certainly have not forgotten how Americans engineered the 1996 reelection of President Boris Yeltsin, a U.S. ally, who, by then, was ailing and alcoholic, with popularity ratings in the single digits, a corrupt entourage, and a legacy of national ruin. Remember that, and much of the indignation over Russia’s alleged misdeeds in 2016 evaporates. We at the very least need some historical perspective – and, of course, the facts an objective Trump-Russia investigation would give us. The intelligence agencies’ report has served as a backdrop for what amounts to a bipartisan campaign in political circles and the media to discredit and eventually unseat Trump and compel him to renounce his oft-expressed hopes for a rapprochement with Russia. Secretary of State Rex Tillerson has visited Moscow and met with Putin, which may have reduced tensions between the two countries somewhat. But this may last only until the next Trump tweet or Trump missile volley. The situation remains dangerous. What counts is that Trump, notoriously sensitive to slights and humiliatingly derided by the press and others as “Putin’s puppet,” may once again feel that he has to demonstrate he’s nothing of the sort. This is where things could get perilous. What if, for instance, Trump, notwithstanding Russia’s newly drawn “red line” in Syria, decides to bomb the “animal” Bashar al-Assad in Damascus? What would Putin, whose only significant opposition in Russia is to his hardline, nationalist right, then find himself obliged to do in response? Escalation would likely ensue. Who would stop it from eventually resulting in armed conflict between the United States and Russia? We can hope all we want that one of the adults around Trump (Secretary of Defense James Mattis, National Security Adviser H.R. McMaster) might get him to act with restraint, but that hope may be unfounded, and, of course, Trump will still have the final word. As well as the nuclear codes. Even without a Trump blunder we are still in danger. Accidents happen. What if American fighter jets bomb Russian troops in Syria by mistake? What if a mishap takes place in the Baltics, where NATO and Russian forces face off? Already, experts worry that major Russian military exercises planned for the region this autumn may result in a miscalculation that could spark a war. In 1983, the United States, in its faceoff with the Soviet Union, conducted drills that almost ignited a planetary holocaust. We don’t want to tempt fate again. But we are perfectly poised to do just that. Other frightening possibilities abound (think North Korea), but what transpires is the urgent need to enact a new détente with Moscow such as I described not long ago in Quillette. A détente is not an alliance, but only a series of practical measures that would ease tensions and reduce the chances of armed conflict with Russia. Beyond that, we should undertake a reevaluation of Russian-American relations, one based not on the diatribes of self-interested politicians and grandstanding cable news commentators, but on how the world works and how the United States and Russia have behaved in it. This means taking an honest look at the global military postures of the two countries. The United States possesses nearly eight hundred military bases in more than seventy countries and territories overseas, and spends about $600 billion annually on defense (which Trump wants to increase by another $54 billion) – more than the next seven biggest defense spenders, including Russia, combined. Russia has one base outside its “near abroad” – a naval base in Tartus, Syria – and spends less than $70 billion a year on defense, an amount it is about to reduce. Objectively speaking, at least if we discount Russia’s nuclear arsenal, it is the United States that is positioned to threaten Russia, not the other way around. More broadly, NATO, despite promises made to the Soviet Union at the Cold War’s end, has expanded up to Russia’s borders; Russia has done nothing comparable. In 2002 the United States unilaterally withdrew from the Anti-Ballistic Missile Treaty (signed with the Soviet Union in 1972), one of the cornerstones of security in the nuclear age, and opened missile defense bases in Eastern Europe. Russia, considering such bases a threat to its deterrent capability, has pledged to counter the United States’ move. The United States is intervening in Syria without legal sanction; Russia, in contrast, is there at the invitation of Syria’s internationally recognized government. With its military operations in the Middle East, Russia is acting defensively, backing Bashar al-Assad to squelch the Islamist threat to the his regime – and to itself. After all, Russia has some twenty million Muslims, a good number of whom reside in the North Caucasus, which has suffered a decades-long Islamist insurgency (now mostly low-intensity) that hardly makes the news in the West. 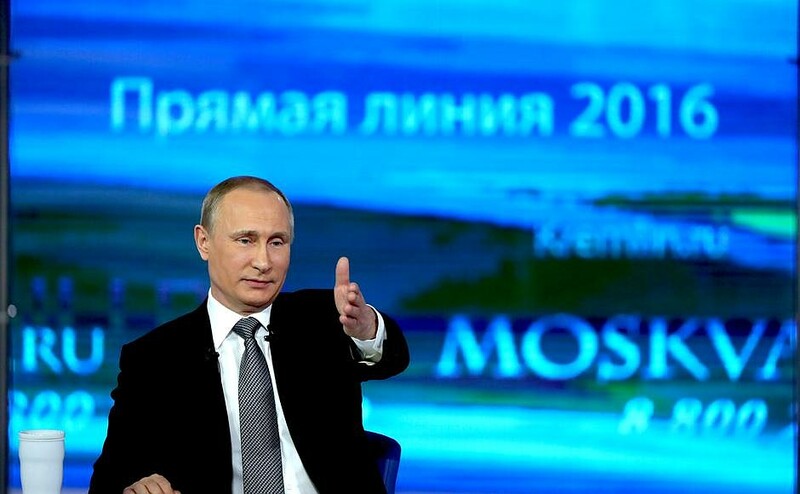 Russia has good reason to fear contagion. The leaders of great powers are generally not pacifist do-gooders, but men and women willing to take, at times, strong measures to protect their countries. (Just ask Nobel Peace Prize Laureate Barack Obama, who authorized ten times more drone strikes than his more bellicose predecessor.) Understanding this renders incomprehensible the vilification to which the American media and politicians have subjected Putin. Putin has, yes, presided over Russia’s return to autocratic governance, which may be distasteful to Americans, but he prevented the collapse of the Russian state – a real possibility at the end of the Yeltsin era. (Read this if you would like an alternative view of the Russian leader and his time in office.) And no one can reasonably equate Russia’s human rights record with that of, say, Saudi Arabia, a longstanding U.S. ally, despite the Saudis’ beheadings, stonings, amputations of hands, and so on. Until allegations of collusion between the Trump camp and the Kremlin are dispelled, there is little chance that the United States and Russia will manage to restore relations and lessen the risk of catastrophe. Trump stands center stage in this unseemly drama, and on his Rabelaisian flaws may depend our future. About the only way we can avert disaster is for us to come to our senses about what Russia is, what it can and cannot do, and what the United States’ role has been in triggering this confrontation. For now, there are few reasons for optimism. “More broadly, NATO, despite promises made to the Soviet Union at the Cold War’s end, has expanded up to Russia’s borders; Russia has done nothing comparable. ” – apart from literally invading the Ukraine! (And arguably also Georgia, although to be fair, South Ossetia was defacto an independent state). And let’s be clear what ‘NATO expansion’ means: former victim countries of Russian imperialism, fearful they would be invaded again, with their people once again shipped off to the gulags, asked to join NATO, for protection, and NATO accepted their application. You might argue it was the wrong thing to do, but the term ‘expanded’ is (unintentionally?) misleading in the imagery it provokes – as thought NATO were a force moving towards Russia, rather than merely accepting the applications of sovereign nations desperate not to be crushed once again. When the author, Jeffrey Tayler, uses the phrase “Russia has done nothing comparable”, he shows himself to be intellectually dishonest. And there are a number of other dishonest half-truths in this article, especially regarding Russia’s involvement in Syria. Quillette should do better – I come here for rational, as objective-as-possible, good faith analysis, and this writing is not an example of it. In future I will have to be wary when reading Quillete articles on topics I know less about. It’s a shame because the general thrust of the article – that there is no proof yet that Trump and the Kremlin illegally conspired – is correct. Although it uses the wrong word – ‘collusion’ – of which there is ample and undeniable proof already. Care to lay it out? “…as though NATO were a force moving towards Russia, rather than merely accepting the applications of sovereign nations desperate not to be crushed once again”. Surely “Chris”, you appreciate that both literally and from Russia’s strategic perspective, NATO has indeed “moved towards Russia”? NATO “merely accepting” applications – really?. And I think “not to be crushed once again” would be better described as retaining independence, or something similar. Excellent article by Jeffrey Tayler, providing another perspective on an important topic. I love Quillette but I wouldn’t want see this kind of chomskyan whataboutist pro-Kremlin crap here in the future.